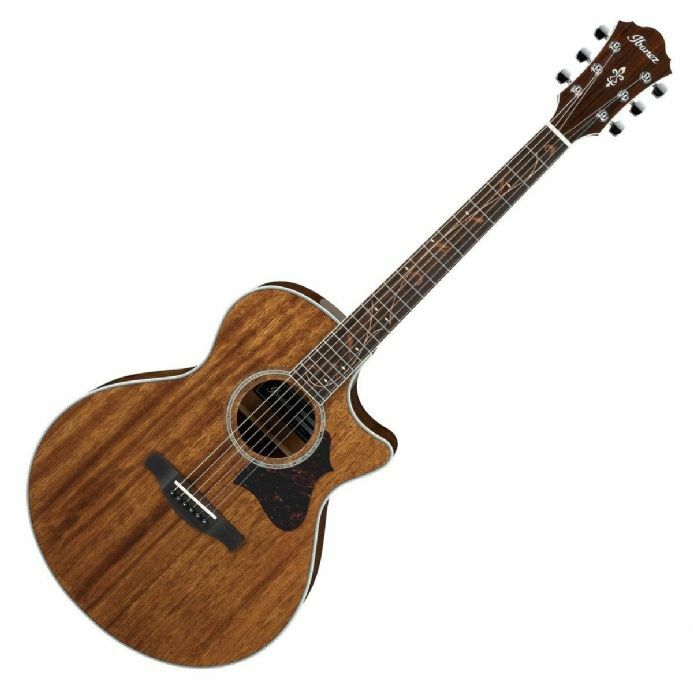 The Ibanez AE245 Natural High Gloss offers a solid top and an all-mahogany construction combined with abalone inlays, specially designed fingerboard inlay, and Ibanez custom electronics, perfect for the gigging guitarist. With a body constructed entirely from mahogany the AE245 2018 produces a clear, direct, and focused sound that is rich, full, resonant with emphasis within the mid-range, falling on the warmer side of the tonal spectrum. In addition, the AE245 features scalloped X bracing that contributes to the sustain and versatility. For added volume, a T-bar undersaddle pickup and custom Ibanez electronics are included, perfect for live and studio environments. The player will also benefit from its cutaway profile which offers easier access to upper frets for a comfortable performance. With all this as well as a gloss finish, abalone inlays, faux tortoise pickguard, this stunning guitar offers extreme versatility and is perfect for studio use, as well as live performances.